Cloud computing - How much of your data should be online? Cloud computing is the latest buzzword in the information technology world. Everybody is in it. Most famous of it is the Amazon’s cloud. This of course comes after twitter has taken the top 5 places. A little bit of low-down on how I understand cloud computing. Your data sits on a space called cloud. The same cloud can host data of some other people as well. You will access this cloud as and when you require it and pay accordingly. If a blog is hosted on a cloud, you pay for the amount of storage you have consumed and the amount of bandwidth you are using. It is pay as you use against what the regular hosting companies charge (500 GB storage and 1 GB bandwidth). 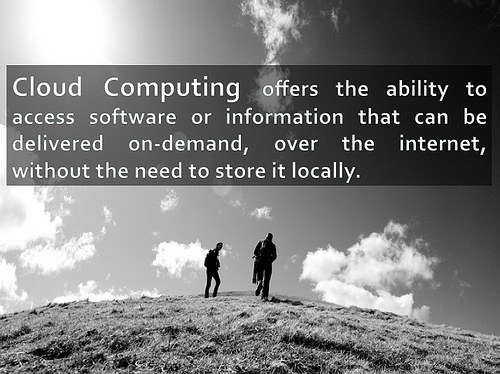 The benefits of cloud computing are numerous. It will be hugely beneficial for startups that don’t have a long-term strategy or who cannot assess what the future looks like. The cloud will scale as per their requirements. It is good for blogs, which are growing at a rapid space. What about the rest? Is this something, which can be used, in large corporate who know their requirements very well and whose IT strategy is well defined? I hate to use this clichÃ© but as they say the proof is in the pudding. The jury is still out and only time will tell. If I don’t have to use those politically correct clichÃ©s, here is my 2 cents. May be worth even more but you are the judge. Cloud as a long or short term strategy for large corporate (let’s a say $1bn large) will not work. Corporate’s just do not trust their data with Amazon or some other provider. Large corporate’s need control on their data. They need to shut down or start up. They would not invest in something, which they don’t have control on even if it costs half as much. Databases, ERP’s cannot move to cloud. For startups, yes they can. But, once your company ceases to be startup you will invest in something trustworthier. For everything else like the desktop applications, word processors, spreadsheets cloud is a way to go. If you were a part of a large corporation would you trust your data on a cloud? Hypothetically speaking, can ICICI Bank move to cloud? PS : Clouds are something which you can see but can’t touch. The same thing applies in this cloud too. Tips that will put you ahead of the pack in your Job search! @Sriram cloud does not necessarily mean insecure. ICICI would definitely be a customer for somebody like RackSpace.com where they would rent the infrastructure, but retain control of the data. That would allow them to save on power and space and hence benefit from the cloud. @Sriram, Interesting point made – but you see Cloud computing was never for these so called Large corporates. Do you know that the share of Large corporates and probably companies like ICICI bank is less than 5% . They will never be on cloud computing. But Cloud computing offers a lot to 95% of all other sites. Infact, Cloud computing does one thing very well – Unclog the Internet from unnecessary traffic. Cloud serves data to end user from Nearest location to him, saving upon backbone bandwidth to a large extent. Infact, what I see few years down the line is majority of hosting servers will be in the cloud – They will have farms geographically distributed that serve data, and probably half of all the sites/blogs on the Internet will be on the cloud. The trend has actually already started and catching up fast.